In light of recent discussions of ink and the ingredients used in it's manufacture. I thought it might be helpful to post a detailed explanation of how it's actually made. I apologize if the post is somewhat long, but hopefully it will shed some light on the issue. 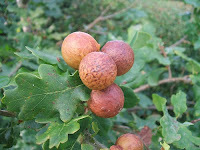 Oak galls are formed when the tiny torymus sp. a wasp, lays her eggs in the twigs or leaves of a living oak tree. Here is the torymus sp. perched on a blade of grass, which gives the scale of the insect. could this be the result of too much laquer thinner? I checked a pair of tefillin yesterday where the shel rosh was clearly damaged by a black liquid like substance that had gotten onto the bottom of the shel rosh parshiyos (see pic). After closer examination I saw that the bottom of the bayis, ie the tip of the mechitzos, had it as well (see pic). Clearly liquid entered the bayis at some stage and did damage. 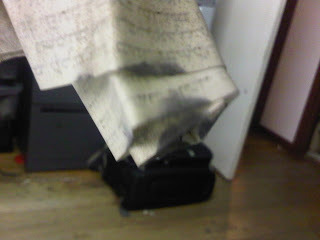 I have seen water damage but this was different because it left a grey / black stain whereas watermarks are usually clear. I think what happened here is that the bottom of the bayis had paint which was washed off with laquer thinner. You can still see some of the paint in the charitsim on the underside of the bayis. The dirty liquid (laquer thinner mixed with the paint) went thought the holes of the tefiros and enetered the bayis, staining the lower bayis and the bottom of the parshiyos. Clearly the guy used too much laquer thinner. I cannot think of any other way these parshiyos would have got damaged in such a manner.